Now, wine clubs have sprung up all around the world with offers of reds and whites to tempt adventurous palates. It all started, however, with the original Wine of the Month Club. And, now we can introduce it to you, if you haven’t heard of it before, or if it was nestled somewhere in the corner of your memory, as it was with ours. Paul Kalemkiarian launched the company in 1972 as a means of making good wine more accessible to the public. There was so much choice; enough to make wine shopping confusing for the average individual. Since that time Paul Jr. has taken over the company, still based in California, but the biggest changes come from the world of wine. 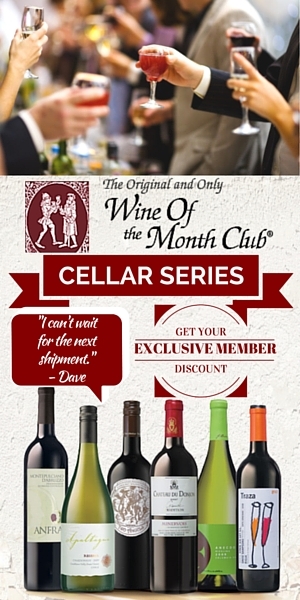 There are five types of personal memberships: Classic Series, California Series, Vintners Series, Limited Series, and Cellar Series. First, the Classic Series: two bottles, one each of red and white measuring 750 ml. Select only red or white if you prefer and choose your terms: every month, every other month, or every third month. Opt for the California Series and discover bottles that compete with the best of France’s Bordeaux region. Consider wineries from the Napa Valley you might never have come across otherwise. The Vintners Series is their most recent addition: a chance to explore even more varietals; more wine-making styles. Their Limited Series highlights very special wines; the kinds ordinarily too pricey for your budget offered at a more affordable price. Finally, try the Cellar Series for yourself or a friend. These are wines worthy of cellaring for a special occasion next week or next year. Customer reviews will help you decide on a membership. Browse their website for gift ideas: gift memberships from all of their five series, baskets, accessories, and gift certificates. They carry featured wines in the “Wine Shoppe” catalogue at reduced prices from what you can expect on retail shelves. Sometimes these include amazing price cuts such as $7.99 for the 2012 Pinot Noir from Windrun (regularly $19.99) or the same price for a $35.99 bottle of Denier-Handal Petite Sirah from 2012. You can even order a Mystery Case and take your chances. Wine accessories include t-shirts, wine glasses, cooling glasses, and a Vinturi White Wine Aerator. Choose a corkscrew of your liking, a Wine Tasting Party Kit, or a Chill Pour Spout. These all make excellent gifts for someone else or as a personal treat. Use the club website to expand your knowledge. Their education section includes tips on how to taste wine, information about wine regions, and wine comparisons. There is even a section discussing certain drugs which alter the taste of wine and how people might react when they drink wine. After all, club membership could be a first introduction to Cabernet Sauvignon, Pinot Noir, and Chardonnay. We were very pleased to see that they are still going strong after all these years, and we now carry a section here at myfavdeals.org dedicated to the special promotions offered through the Wine of the Month Club. Please visit it and bookmark it so that you can check back to see the coupons and other promotions that they frequently give us to post! Check out the Wine of the Month listings HERE.